Most lawyers aren’t experienced in defending criminal cases in federal court, where the prosecutors, judges, and juries are different than they are in California state court. 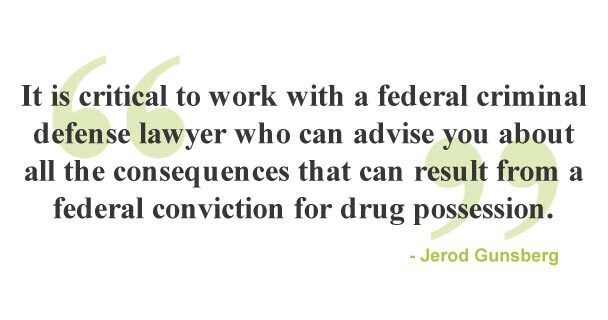 At the Law Offices of Jerod Gunsberg, we use our extensive federal court experience to aggressively defend people who have any involvement in a federal drug possession case in federal courts throughout Southern California. Federal law makes it a crime to possess a wide range of drugs including Cocaine, eroin, Marijuana, Methamphetamine, Opium, and PCP. Specifically, under 21 U.S.C. Section 844, the penalties for simple possession of most drugs depend, in part on the number of prior violations. Thus, for example, someone with no prior convictions can be jailed for up to one year and be ordered to pay a fine of at least $1,000. Someone with 2 prior convictions for drug possession is subject to a jail term between 90 days and 3 years and a minimum fine of $5,000. The federal government has since the 1980s punished possession of crack cocaine more severely than powdered cocaine. In 2010, President Obama signed the Fair Sentencing Act, which reduced some of the disparities of the sentences imposed for possession of crack cocaine. Specifically, a first conviction for simple possession of crack cocaine is penalized in the same way as simple possession for powder cocaine—with a maximum prison sentence of one year. Penalties for simple drug possession are often more severe under California law. This is one reason why federal prosecutions for drug possession are relatively rare. When a person in the Los Angeles area is found with a small amount of illegal drugs, that case is generally prosecuted in California state court. Federal prosecutions for drug possession often raise complicated related issues that can be as important as the drug possession charge. Specifically, under 21 U.S.C. 881, prosecutors can seize personal property or real property that is used to facilitate possession of a controlled substance. This can and often does include cars, boats, or aircraft that are alleged to have been used to transport the controlled substance. Most commonly, federal prosecutors seek to seize any money that is associated with drug possession, including cash as well as money that is in bank accounts. Federal Drug Possession conviction can also lead to loss or denial of federal benefits such as student loans, grants, government contracts, and professional licenses. Increasingly, drug-related convictions can have adverse immigration consequences, including deportation. It is therefore critical to work with a federal criminal defense lawyer who can advise you about all the consequences that can result from a federal conviction for drug possession. There are a number of valid defenses that might apply to a federal drug possession charge. For Class II controlled substances such as cocaine, methamphetamine, and PCP, which have certain recognized medical uses, obtaining such drugs under a valid prescription is a defense. There are also regulations that allow certain registered users to possess precursor and other chemicals whose use is regulated by federal law. 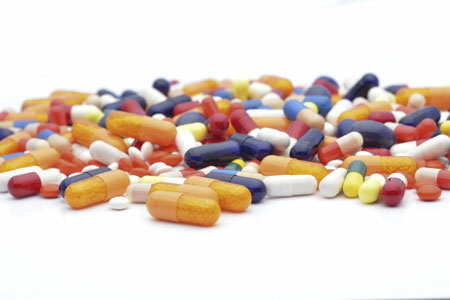 Most drug possession cases, however, are defended by reviewing the evidence that the police and the prosecutors are relying on. This includes reviewing police reports, interviewing witnesses, or otherwise conducting an investigation that undermines the prosecutor’s case. Because federal law creates much more severe penalties for drug trafficking crimes, an important element of any drug possession defense is showing that drug possession, if it took place, did not involve an intent to distribute. Local Expertise in Federal Courts. Given the penalties imposed in federal drug possession cases, and the potential consequences of a drug possession conviction, it is critical that you work with a lawyer who is experience in defending drug possession cases in federal court. Whether your situation involves the DEA, FBI, or ICE, or whether you may only be a “witness” in a drug possession case, the Law Offices of Jerod Gunsberg will aggressively defend any drug possession charge based on our extensive experience in the Federal courts.